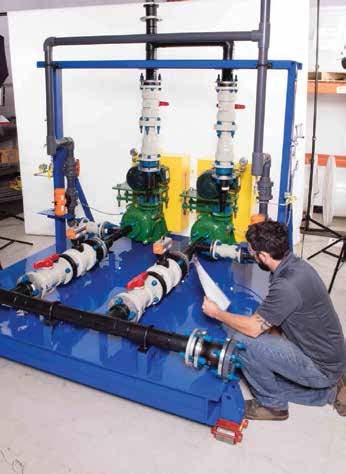 A worker inspects a pump skid at Aztech Controls. Photo courtesy of Aztech Controls. For equipment designers in processing industries, there are aspects of any system that are more functional in nature, yet still critical. This includes gas, fluid, and chemical handling systems that play an integral role in equipment that extracts, dispenses, blends, controls temperature, or some other aspect of control. However, even within the category of contract manufacturing, there can be a broad range of capabilities. Some shops focus solely on build-to-print projects, often in niche categories, such as piping or sheet metal work. On the other end of the spectrum are companies that offer a more diverse range of capabilities, complete supply chain management, and engineering services. “The truth is OEMs don’t always know how much engineering and design support they actually need,” said Medhurst. “They’ll ask us to build a system and say, ‘We’ve engineered it for you,’ and when we get in there, we discover the design is in its infancy. In other cases, we receive well-developed drawings and the engineering requirements are minor. Then, we might help them with supply chain management.” Medhurst added that this can include sourcing, purchasing, and holding in inventory all the individual component parts of the system. With this type of support, OEMs are truly free to focus on the higher revenue, proprietary aspects of their system. For large OEMs, outsourcing frees up a valuable resource: time and attention. The ability to offload some of the “detail work” allows key personnel to concentrate on more important functions, such as client relations, scheduling, and managing the budget. “Outsourcing opens up a lot more time for me to focus on other areas of the project instead of having to worry about some of the minor details that eat up valuable time,” said Tony Harlan of Kurita America, one of the world’s largest suppliers of industrial water treatment systems. Kurita America’s industrial water treatment solutions include everything from chemicals to custom designed and constructed water treatment, re-use, and reclamation systems. The company also offers operation and maintenance services. However, to create these systems, it is standard practice for companies like Kurita America to outsource aspects of the mechanical, electrical, and control system to subcontractors. “Typically, we would purchase all the valves, pumps—whatever was going on that skid—and only ask the fabrication shop to do the assembly,” said Harlan. A worker checks a unit at Aztech Controls. Photo courtesy of Aztech Controls. So, when Aztech Controls pitched Kurita on the concept of building the entire system for them, including sourcing all the components, they were intrigued. Aztech Controls (http://aztechcontrols.com/) was originally founded in 1986 as a distribution and rep company for products used for wastewater and other processing industries. Today, the company offers full engineering and manufacturing capabilities to build-to-print or design and build complete systems from scratch. Kurita felt that the company’s long history as a distributor in the industry gave them confidence that Aztech Controls could source the parts at a reasonable cost. 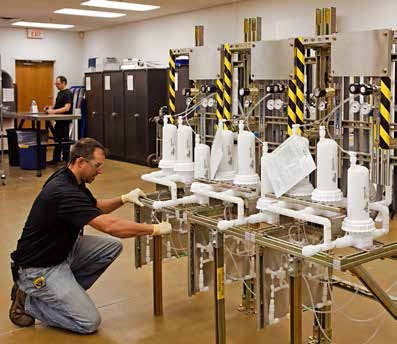 Based on the success of the project, Harlan said that in the past year, Kurita America has worked with Aztech Controls to produce six or seven additional skid-mounted subsystems. David Radnich, a retired engineer, recounted a project for something that he says is a bit of a rarity in the industry—a just-in-time chemical blending and delivery system. The project was part of a cost-cutting initiative to eliminate the need to purchase a very expensive chemical blend for a large semiconductor chip manufacturer. The company had determined it could save a lot of money by blending the chemicals on site because the three constituent chemicals were not expensive. “They built an extremely cost-effective prototype unit and were able to integrate it into our system very quickly—I’m talking a few weeks, not months,” said Radnich. The next step was a full-scale version of the system. Aztech Controls delivered it in six weeks, as opposed to the typical lead time of six months to a year from other vendors. Radnich even went so far as to say his team couldn’t have designed and built the system without the help of Aztech Controls. To date, the system has been working for 6-7 years without any issues, which he called “astonishing” for that type of equipment. The project was also a success in terms of the cost savings the company was hoping to achieve. “It was a cost savings from an equipment standpoint, installation standpoint, and operational standpoint,” said Radnich.